The nation of Grenada has existed for less than fifty years, but history of the Grenada flag extends for more than a century. That is because the vast majority of Grenada flags were used when the nation was still a colony in the British Empire. The flag of Grenada a rectangle that is divided into four triangles surrounded by a red border. Two of the triangles are yellow, while the other two are green. The center of the rectangle features a red disc with a yellow star inside it, while six similar stars can be found within the flag's border. The flag also features a single clove of nutmeg along the hoist. The nutmeg represents the nation's economic history, since the spice was the first major crop to be grown on the island. 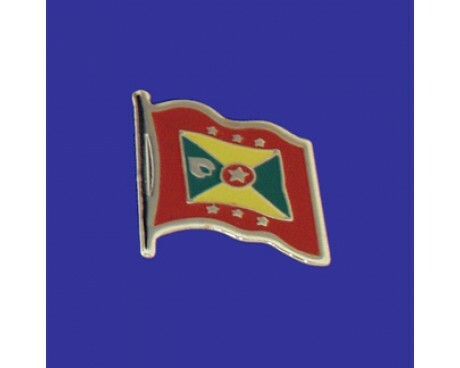 The six stars in the band of the Grenada flag represent the nation's six parishes, while the central star represents the small islands that make up part of the country. 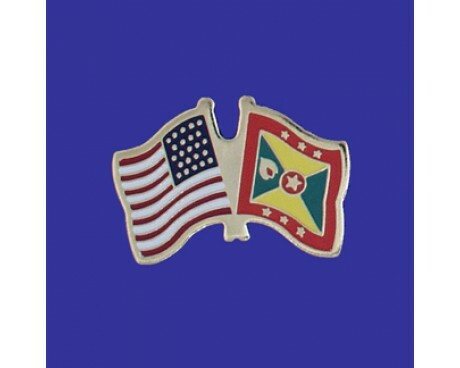 The red border represents both the courage and virility of the country's people, the yellow triangles represent wisdom, and the green triangles are symbols of the country's agriculture and natural plant life. 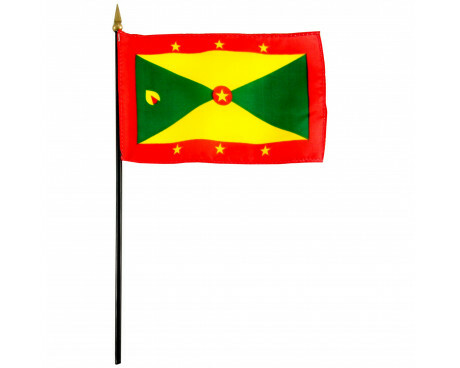 The first colonial flag of Grenada came into use in 1875. It had a solid blue field with the colonial coat of arms in the fly and the Union Jack in the canton. 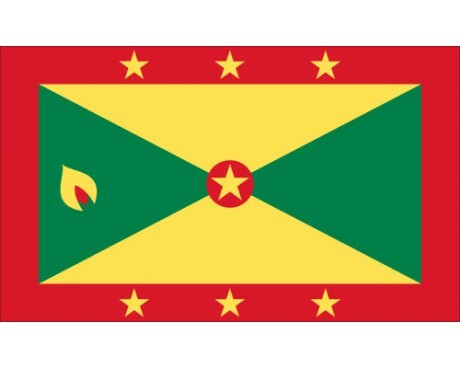 Grenada gained a new colonial flag in 1903. The new flag followed the same general design as the previous flag, but it included a new coat of arms. That flag remained in use until 1967, when the country gained a new flag which was a radical departure from the previous Grenada flags. The new flag was a horizontal tricolor of blue, yellow, and white that featured a central white disc with a nutmeg clove. The design is quite distinct from that of the modern flag, but it includes many of the colors and design elements that can be found in the current design. The modern flag was designed by Anthony C. George and came into use in 1974 to commemorate the nation's complete independence from foreign powers, and it has not been changed since that time.